Bro. Ken Hudson, Lodge No. 43, Lancaster, often wears a T-shirt which reads on the back: “Hazmat Technician. If you see me running, run the other way.” This may be true at the scene of an accident or spill, but people are more likely to flock to Ken and his big heart. Working as a firefighter was a childhood dream … which, in retrospect, Bro. Ken may have gone about pursuing in the wrong way. As an 8-year-old growing up in Philadelphia, he would pull the fire alarm in the building where his family lived just to see the fire trucks show up outside his home. After doing this several times one week, a lieutenant firefighter approached Bro. Ken as he sat outside and watched and asked if he knew who pulled the alarm. “I told him it was me. My mom came outside and was ready to yell at me, when he invited me to the fire station,” he recalls. He spent a lot of time at the station as a youth. He later attended Temple University where he studied film and editing. For one of his assignments, he edited Channel 6’s minority program, “Check It Out,” which included stories on the fire station. He took some training and started work with the Philadelphia Fire Department in 1966.
article describing how he carried a 12-year-old boy out of a burning building – an event he doesn’t specifically recall. Part of being a firefighter is attending training – lots of it. Bro. Ken’s transitioned from firefighting to Hazmat required nine certifications. He continued his training until he became the trainer. Now, he’s instructed over 6,700 students and has shared his knowledge at international conferences. According to his estimate, only three other instructors in Pennsylvania have their own hazardous materials technician training company, aside from colleges and public safety training centers. While he no longer travels due to some health issues, he continues helping others in a different way: as the assistant chief for Hazmat 2 in Lancaster. As the day duty officer, if there’s an emergency during the day, he’ll be the first one from Hazmat on the scene. There, he’ll assess whether it requires the whole team. Some chemicals, like diesel, may not be a hazard. Others, like ammonia and chlorine, require a team of Hazmat technicians dressed in head-to-toe suits. Federal and state laws require anyone transporting hazardous materials to be equipped to clean up any spills, but Hazmat ensures there’s no danger to the general public. A good friend who works as an EMT began talking to Bro. Ken about the Masonic fraternity. After doing his own research, he joined Lodge No. 43, Lancaster, in 2016. 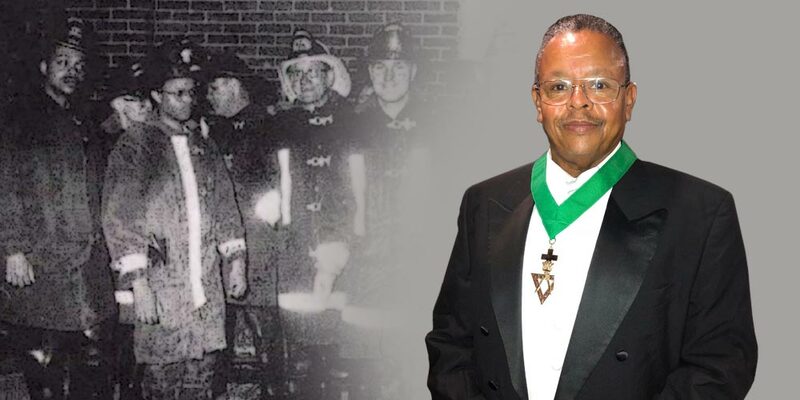 Similar to the brotherhood he experienced as a firefighter, Freemasonry offers him fellowship and the opportunity to help others. Ken also belongs to the Tall Cedars, Royal Arch and Knights Templar and is a 32nd-degree Scottish Rite. As an ordained minister, he serves as his lodge’s assistant chaplain and fills in wherever needed. He’s working on finishing four papers for the Pennsylvania Academy of Masonic Knowledge – a task he has more time for now that he lives at the Masonic Village at Elizabethtown. Ken only moved in September, but he already participates in the men’s discussion group and toured the Masonic Children’s Home. He plans to become involved in spiritual care activities and volunteering on campus. There’s a lot he wants to do, all revolving around his favorite pastime: helping others. Other residents and visitors shouldn’t be alarmed when they see Ken’s Hazmat truck parked outside one of the residential buildings. Instead, they can rest assured they’re in helpful, experienced hands.